As more homeowners make the switch to solar energy in Sacramento, the benefits of renewable energy are becoming more apparent. People are saving money instead of spending it when it comes to energy. As a whole, those who invest in solar are helping reduce carbon-emissions and they are fostering a better future for their families and communities. There’s also a series of common mistakes homeowners are making, which is what we wanted to share today. West Coast Solar wants you to invest in your own home solar system, and we want you to take advantage of the various ways to reduce installation cost over time. 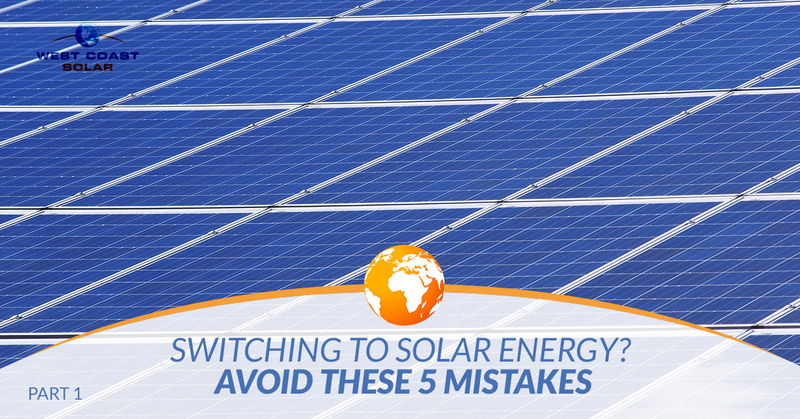 Want to learn about the top 5 solar system mistakes homeowners make? Continue reading to find out! The majority of conversations around solar power is positive. It’s a clean energy source. The renewability of green energy stabilizes market pricing. The use of solar reduces carbon-emissions. Overall, it’s a great way to save money, save the planet, and create a better future for your family. However, many homeowners are approaching shopping for their solar power system with grand expectations, which can diminish the positive effect they are having by going green. Nonetheless, the general lifetime of a solar energy system is around 25 years. If you expected to recoup your investment in less than a decade, you may be surprised. We understand. Solar energy is a long-term investment with positive caveats tied to it, which help more than your bank account. It’s important to understand you’re doing more to help your family, your community, and the planet with the same, if not less, amount of work compared to fossil fuels. In some cases, our team at West Coast Solar encounters a client who has yet to research their financing options for their new home solar system. This isn’t a problem for us since we offer financing options and can help you find what works best for your situation. However, you will want to do your own research. If you’re investing in solar, you need to get the most out of your investment. One option is a solar lease. You can sign a contract, commit to low monthly payments, and pay for your system with zero-down at the start. It’s a great option when applied to certain homeowners’ financial situations. Nonetheless, you’ll want to consider a few drawbacks of solar leasing. The first is that you don’t own the system outright, which can cause issues in rare cases. Also, you cannot take advantage of the federal tax credit if you lease the system. Further local incentives through your municipality may be waived if you lease. It’s important to do your research first. It’s hard for us to say this, but we’ve heard of potential clients going with another solar company, missing out on the tax credit and other local incentives, and spending thousands more for their system. It’s a reality we all have to deal with, and it’s one of the main reasons we’re sharing these mistakes to avoid with you now. Want a Solar Power System? When you set reasonable expectations and research financing, you’re off to a good start searching for a solar power system. West Coast Solar wants you to be informed to make the best decision for you and your family. If you decide to invest in renewable energy, you’ll be benefiting you, your family, and your community. What better way to be a positive impact on the world than reducing carbon-emissions and creating a better future for those around you? Give us a call if you want to get started on your system now! You can read part II of this blog series to learn the final three top mistakes homeowners make when buying solar energy systems.